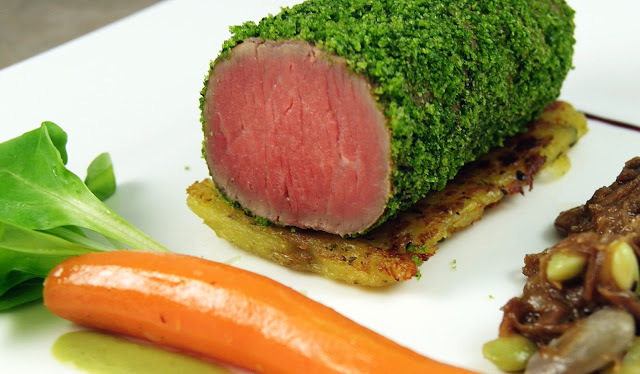 This dish was prepared using some of Spring’s best offerings: Lamb loin with braised lamb shank and speckled butter bean ragout, heirloom carrot, ramp puree, field mache and compressed creamer potatoes. The lamb loin was boned and cleaned, then seasoned liberally with kosher salt and freshly ground black pepper before wrapping it into a cylinder in plastic wrap. It was then placed in cryovac before cooking sous vide at 131 degrees Fahrenheit for an hour and fifteen minutes. It was then taken out of plastic wrap, brushed lightly with dijon mustard and rolled in herbed bread crumb before serving. The herb crust was prepared by pulsing fried spinach leaves, panko bread crumbs and fresh herbs in a food processor. The creamer potatoes were prepared by poaching slowly in duck fat for about a half hour until cooked through. The starchy potatoes take on a very sweet flavor once prepared. The potatoes were then mashed by hand and seasoned with kosher salt and freshly ground black pepper before adding freshly minced shallot and fresh herbs. The potatoes were then vacuum sealed in a cryovac bag and rolled flat with a rolling pin. They were allowed to sit in refrigeration overnight before opening and portioning. The individual cakes are seared in a saute pan before serving. Posted in Entree, Game, SpringTagged compressed potato, creamer potato, heirloom carrot, lamb loin, lamb shankBookmark the permalink.